A United States Navy F/A-18E/F Super Hornet in transonic flight. The term supersonic is used to define a speed that exceeds the speed of sound—a speed that is referred to as Mach 1. However, supersonic airflow is decidedly different from subsonic flow, leading to some debate about the definition of "supersonic." Thus, another definition states that an aircraft (or object) is supersonic only if the airflow over the entire aircraft (or object) is supersonic, which occurs around Mach 1.2 on typical designs. The range Mach 0.75 to 1.2 is considered transonic, when only some parts of the air around the aircraft (or object) reach supersonic speeds. Speeds greater than 5 times the speed of sound are often referred to as hypersonic. Chuck Yeager was the first man to achieve supersonic flight. 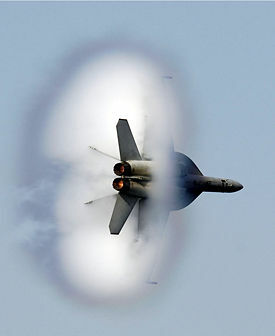 U.S. Navy F/A-18 breaking the sound barrier. The white halo is formed by condensed water droplets which are thought to result from a drop in air pressure around the aircraft (see Prandtl-Glauert Singularity). At a typical temperature, such as 21 °C (70 °F), the value of Mach 1 is approximately 344 meters per second (m/s) (1,129 ft/s, 770 mph or 1,238 km/h). Nearly everything about the way an aircraft flies changes dramatically as an aircraft accelerates to supersonic speeds. Sounds are traveling vibrations (pressure waves) in an elastic medium. In gases, sound travels longitudinally at different speeds, mostly depending on the molecular mass and temperature of the gas; (pressure has little effect). Because air temperature and composition vary significantly with altitude, Mach numbers for aircraft can change without variation of airspeed. In water at room temperature, supersonic can be considered as any speed greater than 1,440 m/s (4,724 ft/s). In solids, sound waves can be longitudinal or transverse and have even higher velocities. Supersonic fracture is crack motion faster than the speed of sound in a brittle material. 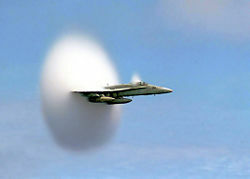 In aerodynamics, the "sound barrier" usually refers to the point at which an aircraft moves from transonic to supersonic speed. The term came into use during World War II, when a number of aircraft started to encounter the effects of compressibility, a grab-bag of unrelated aerodynamic effects, when approaching supersonic speed. The term fell out of use in the 1950s, when aircraft started to routinely "break" the sound barrier. Most modern fighter aircraft are supersonic, but only the Concorde and Tupolev Tu-144 were designed to be supersonic passenger aircraft. Since Concorde's final retirement flight on November 26, 2003, there are no supersonic passenger aircraft left in service. Some large bombers, such as the Tupolev Tu-160 and Rockwell/Boeing B-1B are also supersonic-capable. An aircraft that can still sustain supersonic flight without using an afterburner is called a supercruise aircraft. Most modern firearm munitions are supersonic, with rifle projectiles often traveling at speeds approaching Mach 3. Most spacecraft, most notably the Space Shuttle are supersonic at least during portions of their reentry, though the effects on the spacecraft are reduced by low air pressures. During ascent, launch vehicles generally avoid going supersonic below 30 km (~98,400 feet) to reduce air drag. Note that the speed of sound decreases somewhat with altitude, due to lower temperatures found there (typically up to 25 km). At even higher altitudes, the temperature starts increasing, with corresponding increase in the speed of sound. The aerodynamics of supersonic flight are simpler than those for subsonic flight because the airsheets at different points along the plane often cannot affect each other. However, the aircraft being designed must be efficient and stable at supersonic, transonic, and subsonic flight. Thus the overall aerodynamic principles that operate when designing a supersonic aircraft are fairly complex. Supersonic jets and rocket vehicles require several times greater thrust to push through the extra drag experienced within the transonic region (around Mach 0.85-1.2). When designing aircraft intended to attain these speeds, aerospace engineers have to ensure that air is gently guided around the fuselage without producing new shock waves. Designers use certain rules (the Supersonic area rule and the Whitcomb area rule) to minimize sudden changes in cross-sectional area that could lead to shock waves along the body. At high speeds, aerodynamic heating can occur. Therefore, an aircraft must be designed to operate and function under very high temperatures. For example, the SR-71 Blackbird jet could fly continuously at Mach 3.1 while some parts were above 315°C (600°F). ↑ NASA, Astronomy Picture of the Day: August 19, 2007: A Sonic Boom. Retrieved September 25, 2008. Anderson, John David. 2007. Introduction to Flight, 6th edition. Dubuque, IA: McGraw-Hill. ISBN 978-0073529394. Courant, Richard, and K. O. Friedrichs. 1999. Supersonic Flow and Shock Waves. New York: Springer-Verlag. ISBN 0387902325. Craig, Gale M. 2002. Introduction to Aerodynamics. Anderson, IN: Regenerative Press. ISBN 0964680637. Hallion, Richard. 1997. Supersonic Flight: Breaking the Sound Barrier and Beyond: The Story of the Bell X-1 and Douglas D-558. London: Brassey's. ISBN 1857532538. Young, James O. 1997. Meeting the Challenge of Supersonic Flight. Edwards AFB, CA: Air Force Flight Test Center History Office. OCLC 38892255. This page was last modified on 28 October 2015, at 14:41.